So I know what you’re thinking. Jack, this game’s been out for years. The developer’s already made two more games in the meantime and the game is somewhere around seven years old. That’s like, super old in video game years. Well, that’s pretty accurate. But here’s the thing: the nice thing about games is that when they’re a certain level of iconic, they don’t really age. Or at least not too much. 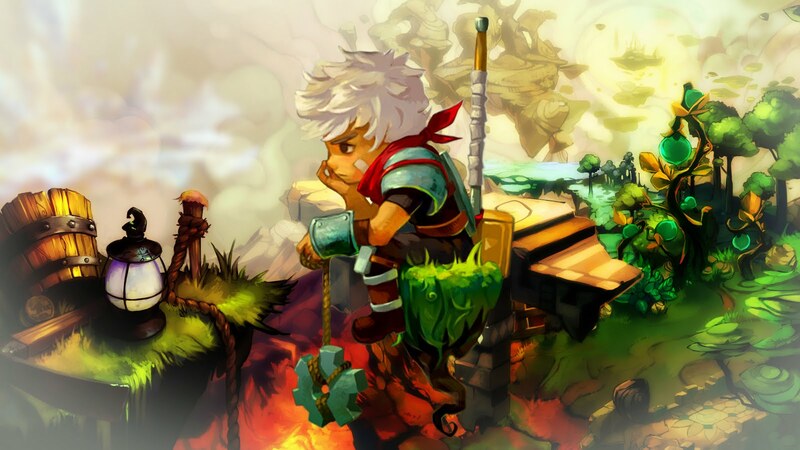 Bastion is still an impressive game and clearly enough people think so that it recently got a port on the Switch. So I’m going to take a look at this one, at Supergiant’s breakout title, and see if it’s really worth all of the fuss. The first thing anyone is going to notice when playing Bastion is the narrator. Yeah, plenty of games will have narration during cutscenes or certain sequences, but Bastion is narrated throughout. The game styles itself as a story, being told by one of the major characters. And it works remarkably well. The narrator, voiced by Logan Cunningham, has a fantastic voice that I never got tired of listening to. The story is about the aftermath of an event referred to as “The Calamity,” which utterly decimated the continent on which the game takes place. You play as The Kid, searching the remnants of the fractured and floating old world to try to find what it takes to put it all back together. Along the way you meet other survivors, uncover a conspiracy around the origins of the Calamity, and face the fallout of what I can best describe as a megaton bomb dropped into the middle of a cold war. As you traverse the world, the narrator becomes a consistent presence for the Kid and the player. He talks about lore, he discusses politics of the areas, he talks about the challenges you face in each level as you do, commenting in real-time to your actions. It’s a great story and the storybook aspect of it really does make it feel special. 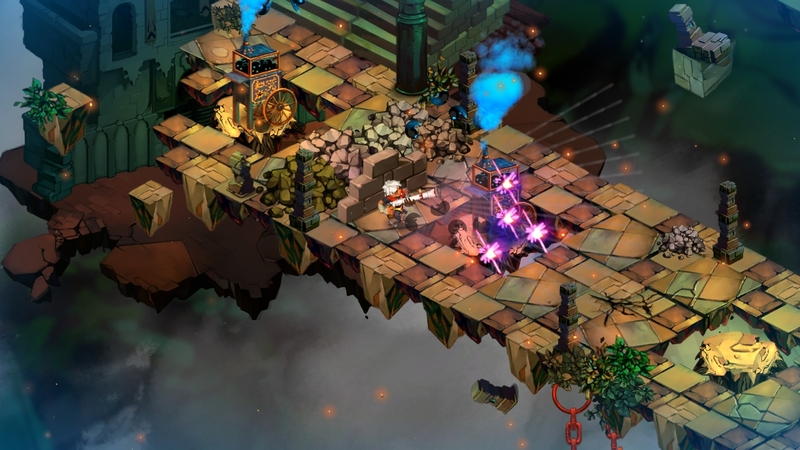 Bastion’s gameplay is a top-down, level based action adventure. The Kid ventures to different areas of the old world to explore and collect, and to fight the dangers that lurk there. To defend himself, the Kid carries different weapons, a total of eleven, of which you can carry two at any time. Weapons are diverse and fun to use, though a number of them feel somewhat unbalanced in certain areas. As you progress through the game, you’ll get to upgrade the titular Bastion, which acts as the game’s hub area. 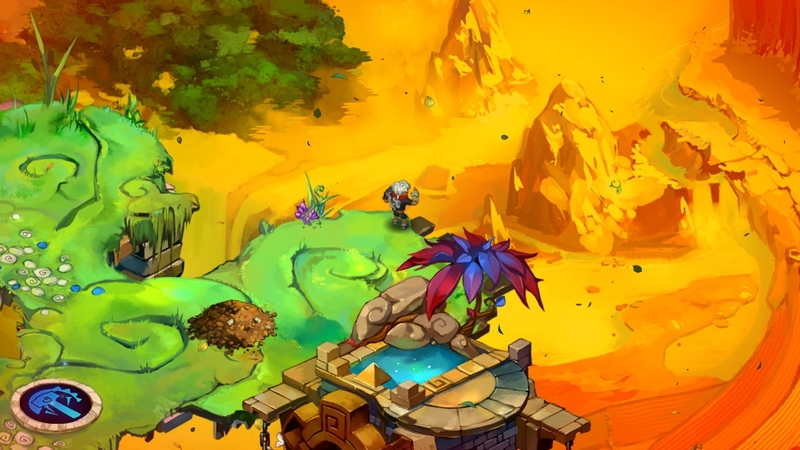 In the Bastion you can unlock different buildings to build, each granting different benefits, like an arsenal to store and switch between weapons, a forge to upgrade weapons with gathered materials, a distillery to select Spirits, which can act as passive buffs going into an area, a shrine to activate special challenges, stuff like that. Between spirits, special moves, weapons, and upgrades, there’s a surprising amount of customizability for such a short game. Which I suppose is nice, for there is a New Game +. 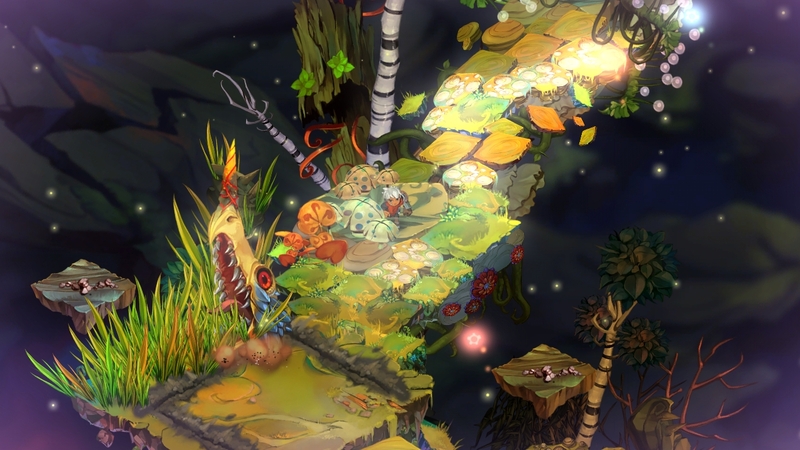 The areas you trek through are diverse and exciting, the main feature of the game’s world being the nature of the levels to build themselves as you travel through them from pieces of rubble floating in the sky. If I have any critique of the combat, it’s that there’s a lot of button mashing, and the enemies tend to lack variety. But otherwise, combat is tight and fun, and there is an element of timing for a lot of enemies. The graphics of this game are, frankly, gorgeous. The backgrounds are all hand-painted, and the levels all have a great sense of design to them. The art is stylized and cartoony, but not to the degree that it detracts from the seriousness of the story. Each area looks different enough to create that lovely variety, and the game gives you a minimalist HUD so you can appreciate it as much as possible. Oh boy. So the music in Bastion is composed by Darren Korb, who describes the musical style as “Acoustic Frontier Trip-Hop.” What does that mean? Good question, but somehow it actually fits really well to describe a soundtrack featuring hard beats and acoustic instruments. The music fits really well into each level, with some songs repeating multiple times through the game as they play over a particular wave battle of enemies or as a character’s leitmotif. Oh, that reminds me. There are a few vocal tracks on the soundtrack, one for each of the game’s 3 major characters, and one for the credits that combines all of their themes. Korb, Cunningham, and Ashley Barret lend their voices to these songs and they all manage to turn whenever they’re played in-game into a truly memorable scene. So a little more about the game’s narration. As I played through Bastion, I was stunned at just how much dialogue was recorded for the narrator. He comments on every type of weapon combo you can equip. He comments on if you idle in an area for too long. He comments on what order you choose to progress through the levels in. Over three thousand lines of dialogue were recorded for this game, and it really shows. One of my favorite moments in the early game happened the first time I accidentally fell off of the path and into the infinite nothing below. The narrator says, “And then he falls to his death,” and the music goes silent. And then it picks back up as you fall from the sky and land on the level again, taking some damage, and he goes, “Nah, I’m just kidding.” It’s incredible how much work went into giving the narrator enough lines to cover just about everything. 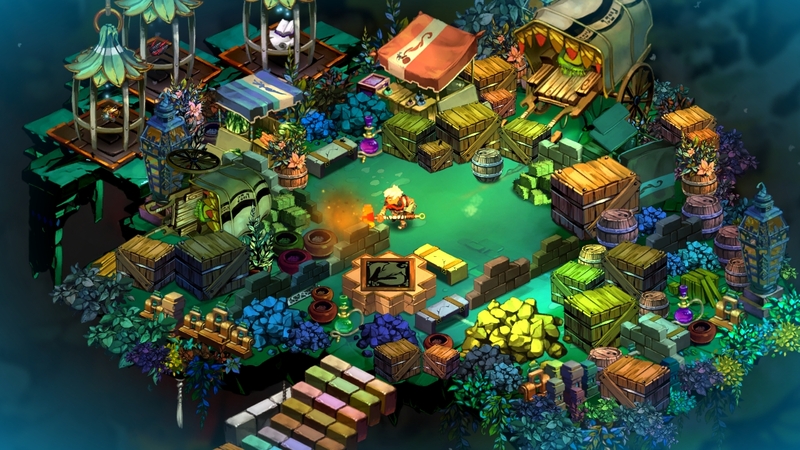 While Bastion has nothing like DLC, there is plenty outside the main story to do. For every weapon you can collect, you unlock a “proving ground” where you are put through a challenge with that weapon to test your skills. These challenges range from, “kill all of these enemies in as little time as possible” to “snipe these targets in only 3 shots.” Success in the proving grounds nets you materials to upgrade your weapons, and special moves you can use with them. One of the buildings you can create in the Bastion is called the Shrine. In the Shrine, you can invoke the idols of the game’s pantheon to make the game harder in different ways, but for increased rewards of experience and money. In addition, certain items will appear in the Bastion that allow you to access an area called “Who Knows Where,” where you can fight through waves of enemies for money and experience, as the narrator tells you the backstory of a certain character. And finally, there is a New Game + you unlock after your first clear of the game. New Game + has even more new dialogue and allows you to play with all unlocked weapons and items from the start. Bastion is a good game. Bastion is a very good game. It’s not a perfect game, but damn it’s an enjoyable one. Especially if you’re like me, and you like unconventional storytelling and stylized indie games.